In June’s Life and Laughter column, I discussed my plans to get prepared for emergencies: man-made, natural, teenage meltdown or low blood sugar. My 72-hour kit was sorely lacking in anything helpful, so I decided to start from scratch. ANYWAY. That made me think of other scenarios that could be considered an emergency. 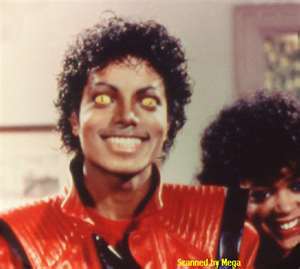 Scenario A: You are invited to a last-minute flash-mob performance of Michael Jackson’s “Thriller.” Do you have creepy contact lenses? A red vinyl jacket with matching pants? 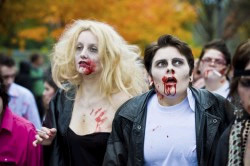 Adding these items to your kit could save you from flash-mob embarassment. Scenario B: Your children, neices and/or nephews are irritating as hell. A supply of pre-filled emergency water balloons (filled with bleach) can help rid yourself of these parasites. Scenario C: Emergency See’s chocolates (self-explanatory). Scenario D: You are traveling in the desert and come across a road runner. 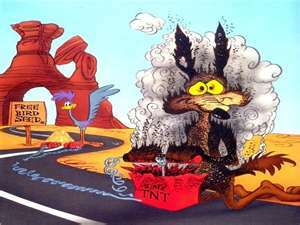 As everyone knows, dynamite from ACME is the only way to kill a road runner. A trunkload of this product will help for those last-minute hunting trips. Adding these items to your boring food, water, first-aid kits and flashlights will really help any emergency seem much more fun.